As an authorised Merlo dealer in South East Queensland, we stock a range that includes Merlo heavy duty telehandlers, construction telehandlers, agricultural telehandlers and the Merlo Multifarmer, which combines the functions of a telehandler with those of a tractor. With more than half a century’s expertise in design and safety, Merlo continues to refine the technology to improve the way we workand thanks to their innovative approach to product development, they are now the world market leader in hydrostatic transmission telehandlers. Built-in display for highlighting load related bar graph, wheels stabiliser work, weight lifted, maximum rated capacity, graphic location of load and attachment installed. Give your business a competitive edge with unparalleled deals on Merlo telehandler rental or sales at Lencrow, with over 40 years of experience in the supply of quality materials handling equipment. Lencrow Forklifts is one of Australia’s biggest independent forklift suppliers and we have consultants in Adelaide, Melbourne, Sydney, Brisbane and Newcastle who can help you select the right equipment for your business. An Australian family business, our goal as a company has always been to ensure that Australian industry has the support it needs with a one-stop solution for its materials handling equipment. And with over 60 staff and five national branches, we’re confident we have what’s needed to continue delivering that service. From a pallet truck to a telehandler, we have the biggest and best selection of new, used and rental equipment in Australia. We can offer a solution to every logistical problem thanks to after sales service and support that always goes above and beyond. All of our workshops are equipped with the latest technology and our technicians are trained to provide a complete range of services. Our Planned Preventative Maintenance System (PPMS) allows us to schedule a tailored service program for your equipment that will minimise its lifetime running costs. 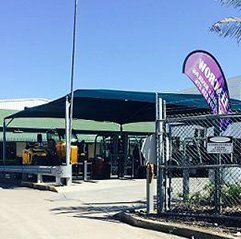 We also have around the clock emergency forklift breakdown service, with average response times of around 2 hours in metro areas and 4 hours in regional areas. Have an enquiry about Merlo forklifts? For further information on our range of Merlo telehandlers or any of our other quality materials handling products, browse our website or call us on 1300 536 276. You can also contact us any time via our online enquiry form or by dropping into one of our five Australia-wide branches.